The Nvidia and AMD GPU cards that are compatible and work greatly with Netstor NA255A enclosure include Nvidia GeForce 10 / 900 series, Quadro P6000 / M6000 series and AMD Radeon RX, R9 series, FirePro W9100 / 9000 series. 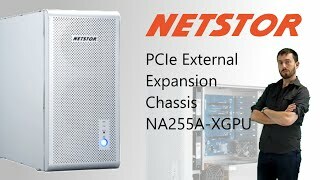 If you buy this NetStor External ePCIe Expansion and hard drives we do free build and test for the unit and hard drives. So you can use this device straight out of the box. All free of charge in NA255A-1500 price. When running out of hard drive capacity on the NetStor, NA255A-XGPU provides an easy way to immediately scale capacity up to 0MB by additional 0 hard drives. The RAID volume on the NetStor External ePCIe Expansion can be expanded directly without having to reformat the existing hard drives, ensuring it continues its service during the capacity expansion.